Construction plans for a North Loop office building could have to be changed after the Minneapolis zoning and planning committee approved Thursday night an appeal by a resident who argued the structure didn’t fit the rest of the neighborhood. The building was planned to be constructed on a surface parking lot between N. 5th Avenue and the Cedar Lake Bike Trail. Developers CPM Cos. and Swervo Development said they wanted to construct a 10-story building with the upper floors used for offices and a retail business or restaurant occupying the ground floor. A skyway-style connection would join the new building to the Internet Exchange Building next to the site. Developers had recently presented a plan that featured eight levels of parking (three underground and five above). But North Loop resident Jerrit Bromley said the new office was not to scale with the surrounding area and towered several floors over nearby structures such as the adjacent Designers Guild Building and the new Arctic Cat headquarters across the street. 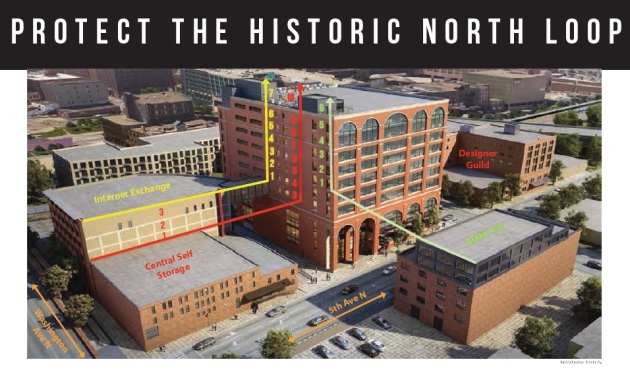 Bromley pushed that the building did not meet guidelines for the historic Warehouse District and technically stood several stories taller than what developers said if the above-grade parking, rooftop mechanical and elevator overruns were included. “I just looked at the size of that thing and asked, ‘how is that even possible?’” Bromley said, in an interview. At the committee meeting, staff said the building is actually 15 stories under the zoning code definitions of height and stories though a casual observer on the outside would think it appears to be 10 stories. The building, located at 419 Washington Ave. N., falls in the Twentieth Century Warehouse Area of the district, which has been designated historically significant because of its commercial development during the early growth of Minneapolis. The maximum that is supposed to be allowed in that portion of the Warehouse District for new buildings is 10 stories. At the meeting, Bromley also pointed out that the proposed floor heights don't follow guidelines and the footprint is larger than that of surrounding buildings. Despite his resistance to the current design, Bromley said he generally supports the building’s construction. The City Council is scheduled to review the decision at a Friday meeting. If the council agrees that the building is not appropriate for the area, developers will have to go back to the Heritage Preservation Commission with a revised plan. The development team is undecided what their direction would be if the plan was rejected, said Sheldon Berg, a principal of DJR Architecture, which is working on the project.